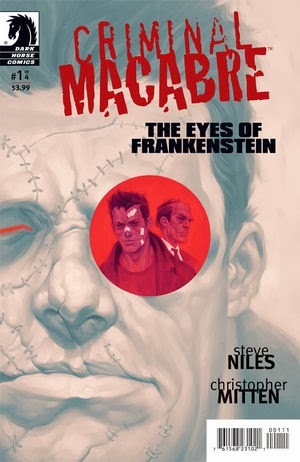 The Fellowship was fortunate enough to obtain a copy of CRIMINAL MACABRE: THE EYES OF FRANKENSTEIN #1 from Dark Horse Comics. Steve Niles writes and Christopher Mitten draws. Cal is a bit on edge, what with the monster war going on. He’s also not feeling well, and it turns out that the ghouls have started dying of, well, natural causes. Luckily (or not, depending on your point of view), he gets distracted from that problem by another, slightly more violent problem: Frankenstein’s monster tearing up a library. Cal offers to help, which almost always gets him into trouble. Cal is one of those characters who you wish would get a break every now and then, but you know he wouldn’t be as great if he did. His sense of the right thing to do is a delightful balance to his appallingly bad attitude. And oh, the snark. It could almost have a book of its own (I want credit if you use that, Steve). This story is no exception; Cal gets more and nastier problems to deal with at every turn, and he slogs through all of it, prioritizing the best he can. In Cal, Niles gives us the snarky, intolerable warrior/savior of the horror genre. He works hard, and he usually does the right thing. Even though he gets the crap beat out of him in the process. This is great stuff. CRIMINAL MACABRE: THE EYES OF FRANKENSTEIN #1 is available now at your LCS and online at darkhorse.com.